Briogeo Hair has created a Rose Quartz Crystal Energy Comb and it is being sold for an extraordinary $160 a piece! Why does a comb cost so much? Well, ancient cultures such as the Romans, Greeks, Chinese, Egyptians, and religions in India believed that certain types of crystals would heal you in different ways. For example, Labradorite is said to reduce fear and insecurities, regulate metabolism, balance hormones, and inspire imagination. Another example would be Amethyst. This purple crystal calms and protects, balances emotions, eases stress, improves memory, eases headaches and much more. This hair care tool has made it into the mainstream market and is being sold at Sephora, a worldwide makeup, haircare, and skincare store. Although crystals are seen more as pseudoscience, I have tested out crystals before and have come to realize that they do have a positive effect on myself and others. Even though I have found crystals to be mentally healing, I was a bit skeptical about this specific product, so I decided to do some research on it. The description on the website states that the Rose Quartz is a symbol of loving energy and can help to clear away unwanted negativity. As I dug a bit deeper, I found an article of an author from Bustle giving the product a try. She was a bit skeptical herself before making the purchase, but her results surprised me. 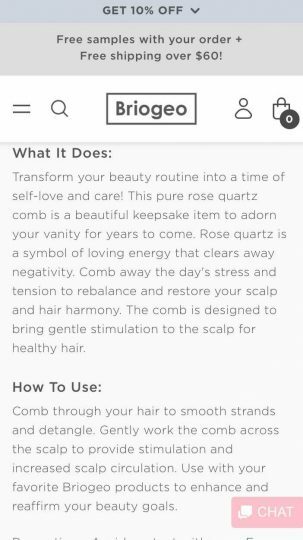 The author said that after testing out the comb for 30 days, she began to feel the calming effects of the lovely rose crystal. The author had taken medication for migraines, but said that combing her hair during the migraine had helped to ease the pain. “Above all, I think the weight of the comb and the gentle massage it provides when combing through your hair soothed my throbbing head,” stated Kate Dupere. You can find the full article here. After reading Kate’s article, I have become interested in trying out this wondrous calming comb to see for myself if it actually works. Maybe someday soon my daily stresses can easily be combed away by this product.